The palace reached the peak of its prosperity in 13th century B.C. The early years of the 12th century B.C. the palace was destroyed by fire. In 1939, K. Kourouniotis located the site of the Palace. Professor Carl Blegen of the University of Cincinnati excavated the area. After the declaration of Second World War, the excavations recommended. The Palace of Nestor is an organized archaeological site. It is a complex of several buildings with a total of 105 ground floor apartments or other premises. It consists of four main buildings (south, central, northeastern, storage wine) and some smaller buildings. 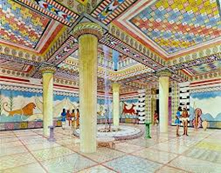 The major departments were the big rectangular “throne room” with circular fireplace, bathroom with tub clay and warehouses with numerous storage vessels.